The big news coming into this, the opening concert of the National Concert Hall's International Concert Series 2011/12, was that the evening's soloist, violinist Janine Jansen, had to cancel her appearance due to illness. Jansen had been due to perform in Tchaikovsky's Violin Concerto, a showpiece of hers, and the cancellation was disappointing. It was all forgotten by the end of the evening, though, thanks to a spectacularly high calibre show, one of the best concerts I've ever attended at the NCH. Every bit the maestro, urbane and forceful Charles Dutoit on the podium led a magisterial Philadelphia Orchestra that showed itself to be at the top of its game, with stand-in pianist Jean-Yves Thibaudet, a friend of the absent Jansen, also putting in an exhilarating reading in Ravel's Piano Concerto in G.
Being a prominent evening on the capital's social calender, famous figures aplenty milled around the venue's foyer beforehand: Ireland's Tánaiste (or Deputy Prime-Minister) Eamonn Gilmore, Senator David Norris, sports pundit George Hook, and RTE News presenter Eileen Dunne some of the faces visible. 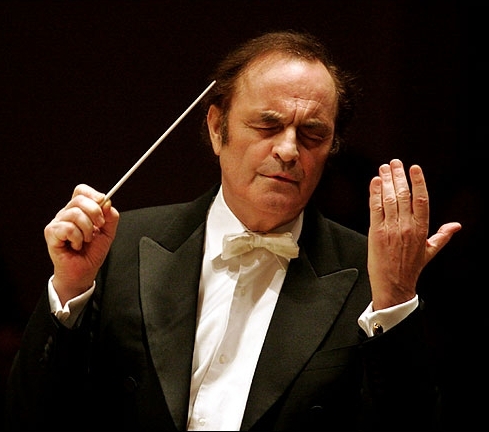 Charles Dutoit has been here in recent years with the Royal Philharmonic, but this was his first visit with the Philadelphia Orchestra, of which he is current Chief Conductor, and it was also the Orchestra's first time to the NCH. One of the so-called 'Big Five' American Orchestras, the Philadelphia Orchestra has had a long history, with a short list of Principle Conductors, including Stukowski. It was sad then to hear earlier this year of its filing for bankruptcy, and for me all the sadder after witnessing its quality here. It was evident throughout that Dutoit is firmly in charge. With the players supremely focussed at all times over the long concert, Dutoit's sternness was seen to reep dividends, and it was a joy to witness how on-the-button the orchestra is as a unit, firing as one tremendous instrument. Another factor in the concert's success was a well thought-out programme, a collection of works individually familiar enough to be 'non-threatening' but whose juxtaposition was stimulating enough to provide jolts and excitement. Sibelius's Finlandia had a spritely pace under Dutoit's baton, and the orchestra glistened. Given the current execrable state of Ireland as a nation, the dread of the opening brass chords, rather than giving way to a utopian nationalism in the main theme, suggested more a nationalist dream gone wrong somewhere in the past. Coming onstage for Ravel's Piano Concerto, Thibaudet showed no nerves in his short-notice stand-in for Jansen. Though the orchestra was shaky at the Allegramente's outset – the opening whip-crack on tam-tam was awkward, and the opening piccolo solo missed the pace – Thibaudet was a cool customer, mixing deftness of touch with the utmost clarity. After a plaintive Adagio Assai, the final Presto hurtled along like a bullet. Thibaudet took on a cartoonish aspect, his fingers dancing the span of the keyboard and playing cross-handed with poise. And needless to say, it was welcome that virtuosity was shown to require neither histrionics nor gurning. Rachmaninov's Symphonic Dances is the Russian composer's final work. Written in 1940, it was premiered by and dedicated to the Philadelphia Orchestra. In the wrong hands it is the type of work that can get bogged down and overwrought, but Dutoit's pacing was flawless and the work thankfully absent of melodrama, concentrating rather on the balanced weight of the writing for different orchestral groups. It was fascinating to see here how, as in the programmed works by Ravel, timbral sequence begins to emerge as just as important a compositional factor as harmonic sequence. Rather than simply splashing colour on notes that would be unchanged in a different arrangement – piano transcription notwithstanding – compositional weight is focussed here on timbre itself in its specificity, as in Webern and the avant-garde music of the succeeding decades. This was most apparent in the second dance, a simmering and saturnine waltz. The final work on the programme was another waltz, or perhaps rather a dream waltz, Ravel's La Valse. In its original conception this work was to be called Wien, the metonym pitching the ruin of post-war Vienna with the ruin of the musical form. What starts out as low rumblings, suggestions in the distance, soon lurches into view as a waltz in full flow, like a record player turning on with a record under the stylus. Over the passing minutes the brocaded textures of the refined dance are torn apart as the dance swirls into Dionysian frenzy. Ravel's brilliant orchestral writing was the perfect showpiece for the orchestra, and Dutoit brought the work to an explosive climax and the audience to its feet in ovation. 'Would you like to hear some more?' Dutoit asked from the stage once the applause had finally died down, before leading the orchestra in Sibelius's Valse Triste, whose sumptuous piano was like a figure-skater skating the thin ice of a vast frozen lake. After some more extended applause Dutoit asked the same question again, and finished off with the Overture from Glinka's Ruslan and Ludmilla.